Here’s an online slot game for anyone interested in play slots and also high-value robberies. If you’re not looking to find yourself on the end of a hefty prison sentence anytime soon then you can simply play this video slot and satisfy your needs this way. Art of the Heist is brilliantly animated and features a range of cut scenes that appear following every spin and help move the story of the heist on further. This can be toggled on or off. See for yourself the innovative and beautifully designed game that Art of the Heist is and spin today. With over 30 high definition online slot games and plenty more in the pipeline, Playson has taken the online gambling industry by storm, and they were only established in 2012! Since then they have expanded considerably with over 250 members of staff across the world, they have also established a number of partnerships with Leander Gaming, Quickfire, Bet Construct and 1X2 Gaming which demonstrates that they have the ambition and ability to stake a claim in this highly competitive business. You can learn more about online slot games created by Playson. Step into the life of the unsung criminal: the cat burglar. When you start up Art of the Heist you will be treated with an opening cinematic where you get to watch the thief Vincenzo, at work. But this is no ordinary break-in, soon Vincenzo will have to dodge danger in this spooky museum as there are mummies roaming the halls! One of the unique online best slot games to play, this one takes place at night under a starry night which provides the perfect cover as you break into an old museum to perform the perfect heist. 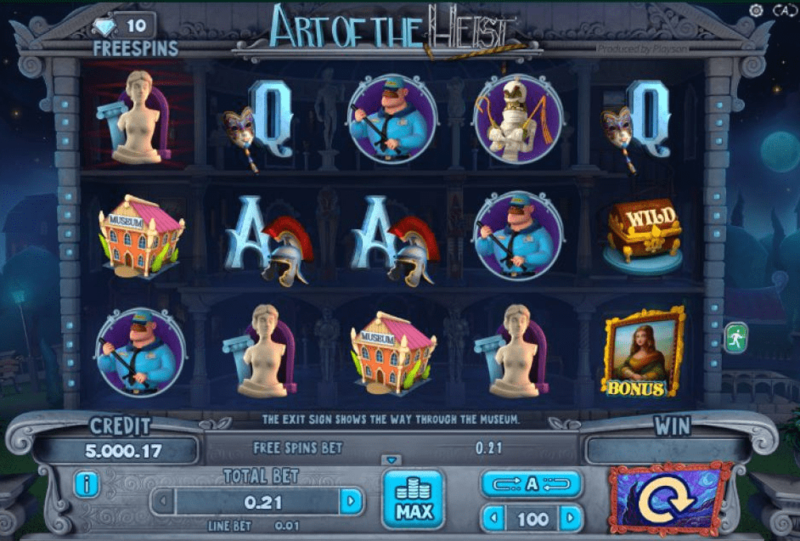 Art of the Heist is a 5 reel, 21 payline online slot game. You can start your bet at 21p up to £63 per spin. Decorating the reels are your traditional playing card letters, A, K, Q and J. You’ve also got museum artefacts for symbols such as crowns, statues, security guards, walkie talkies, mummies and museums. The Crown symbol and the Treasure Chest symbols both act like the Wild and will substitute for any symbol bar the Bonus symbol. They are also the highest value symbols on the reels, awarding you a multiplier of 300x your line bet when 5 land on a payline. The main feature of this game is to help Vincenzo make his way through the museum to the escape vehicle by moving across the reels, how he moves will depend on what symbol he lands on. The Alarm Keypad will move him 1 – 3 steps forward, when he lands on the Treasure Chest Wild he will add 1 – 2 Free Spins to your counter. Mona Lisa is the Bonus symbol and when Vincenzo lands on her the Secret Treasure Room feature is activated. You will then be taken to a top-down-view of the museum, you will be given 7 keys to open 7 rooms. Open each one to reveal cash prizes. If you’re lucky you may find 2 more keys for 2 extra doors, but watch out for the guards! Once you encounter 3 the bonus feature ends. The Mummy symbol will push Vincenzo back two steps and the Policeman will hold him in place for 3 spins. When Vincenzo reaches the escape vehicle at the bottom right-hand corner he will trigger the Free Spins bonus which gives you 10 Free Spins plus any that you have collected on your way. 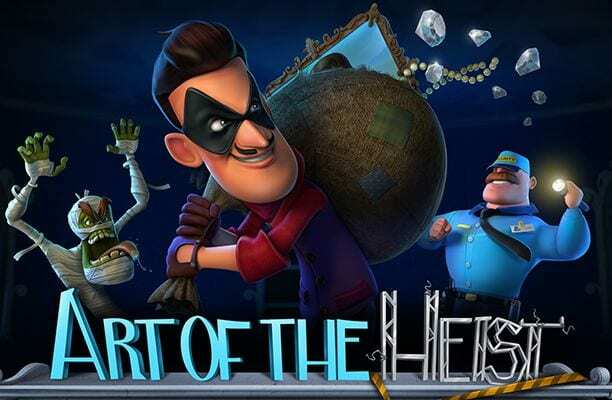 Art of the Heist is quirky and fun with a superbly executed theme and innovative gameplay. The bonus features are worth sticking around for as you can potentially win some really big cash prizes.